Company Lödige Singapore successfully finished railway endurance testing on their chain conveyor and right angle deck. The Lödige equipment will be used for check-in and bagage handling on the Delhi Metro Airport Express Line. A right angle deck and chain conveyor (both with clamped and loaded container on top) have endured 3-axis vibration testing according IEC 61373 on the multishaker and QUAD shaker. Last week the Herschel Telescope has arrived in the test centre. 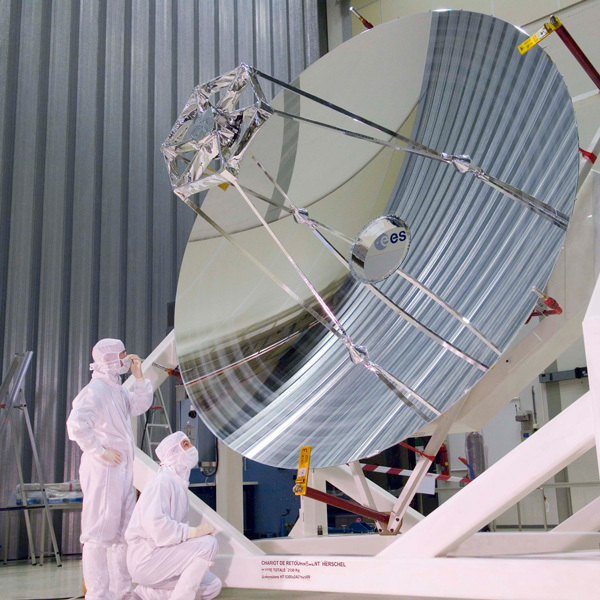 Currently the telescope is being inspected after which it will be integrated to the Herschel spacecraft. The telescope has the largest ever built mirror for a spacecraft, which is 3.5m in diameter tall and made out of the ceramic Silicon Carbide. 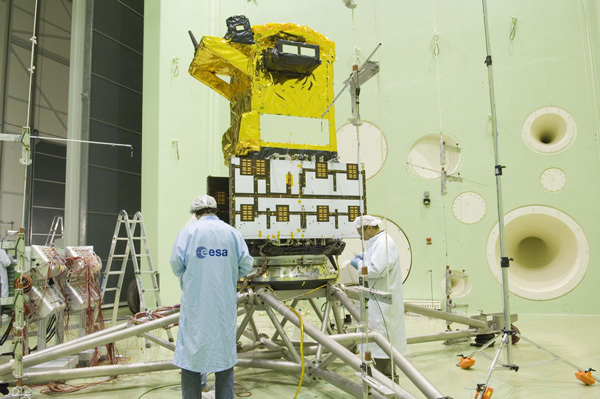 When the integration of the Herschel spacecraft is completed, the spacecraft will undergo its environmental test campaign in the ESTEC Test Centre. The Galileo Giove B mechanical tests (a.o. acoustic noise test, see photo) have been successfully accomplished. 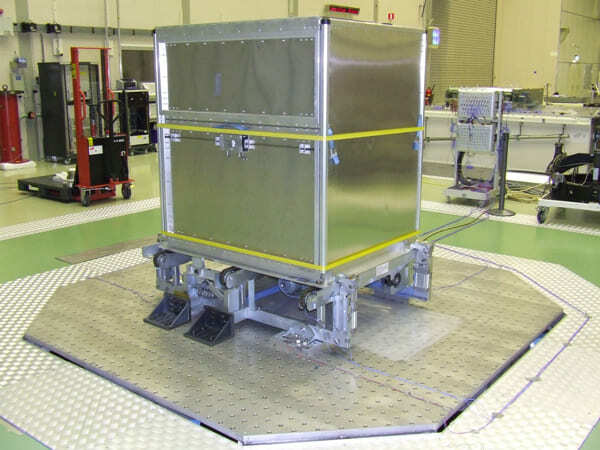 The AIT team from Thales Alenia Space Roma is now preparing for the EMC and PIM test in the Maxwell Facility. 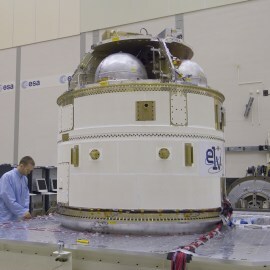 GIOVE B, or Galileo In-Orbit Validation Element, is the second satellite built for ESA to test technology in orbit for the Galileo positioning system. 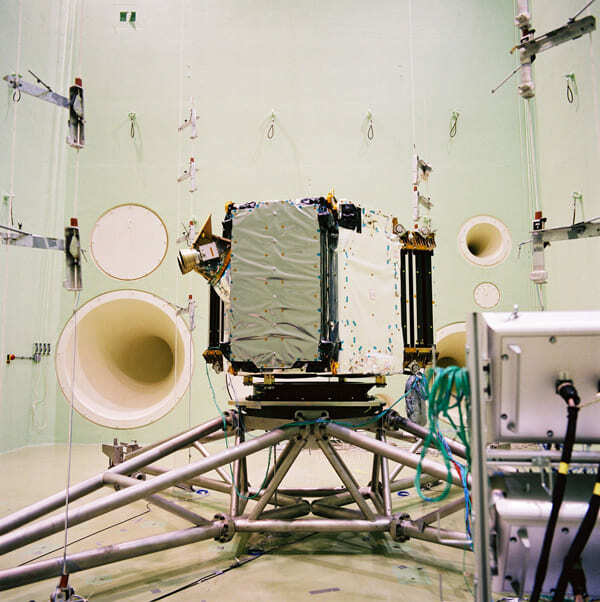 The SMOS PLM PFM test campaign has started two weeks ago. The mass property measurements as well as the acoustic noise test have already been successfully finished. 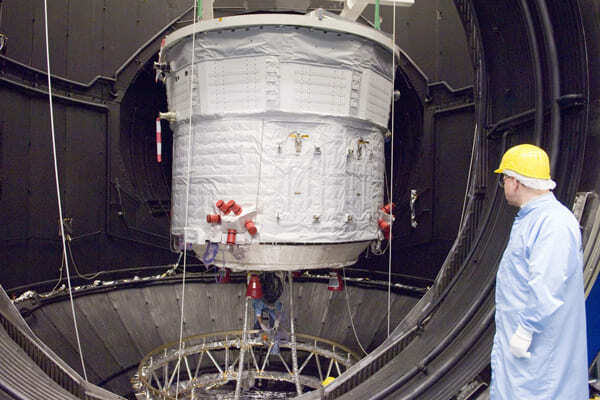 The tests still to be performed on the PLM are an EMC test and a thermal vacuum test. The SMOS PLM PFM prime contractor is EADS CASA Espacio. All acoustic tests on the 4th stage (AVUM) and payload composite of the VEGA Launcher have been finished. The acoustic tests on the VEGA AVUM and payload composite are the last tests of the VEGA STM test campaign at ETS/ESTEC. This test campaign that also included vibration tests has been very successful. Prime contractor of the VEGA project is ELV, an AVIO Group and ASI Company. Currently the ATV Jules Verne is preparing for a thermal vacuum test in the Large Space Simulator (LSS). 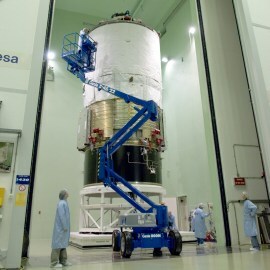 The Spacecraft has been installed last week in the LSS (see photo) and the Integrated Cargo Carrier (ICC) will be installed this week onto the spacecraft. 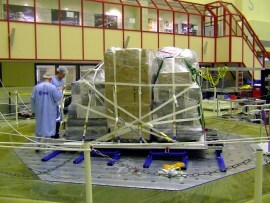 Mounted together the spacecraft and ICC measure a height of 10 metres and a width of 4.5 metres. The ATV Jules Verne is an ESA project with Astrium Space Transportation as prime contractor. The VEGA Launcher Test Campaign at ETS/ESTEC has continued with the Vibration Test of the AVUM (4th stage) together with the payload composite (satellite dummy, payload adapter and separation system) on the Multi Shaker Facility. The next test is the acoustic noise test of the AVUM together with the launcher's fairing in the LEAF. The picture shows the AVUM and payload composite on the Multi Shaker Facility. The VEGA Launcher Test Campaign at ETS/ESTEC has started with a resonance search on the launcher's 4th stage (AVUM) mechanical model using the 320kN Multi Shaker Facility. 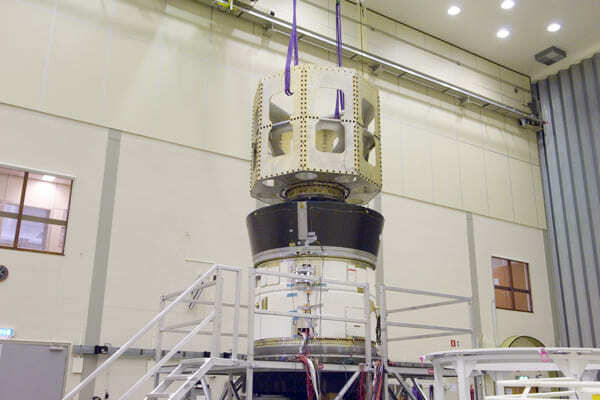 At a later stage, the AVUM will be vibration tested together with the payload composite (satellite dummy, payload adapter and separation system). The VEGA test campaign will be concluded with acoustic tests on the AVUM and fairing in the LEAF. The picture on the right shows the AVUM on the Multi Shaker Facility. Last week Airbus has successfully finished its cargo system tests on the HYDRA vibration facility. Goal of the tests was to verify the occuring loads in the latch between cargo rails and cargo payload at different acceleration transients. 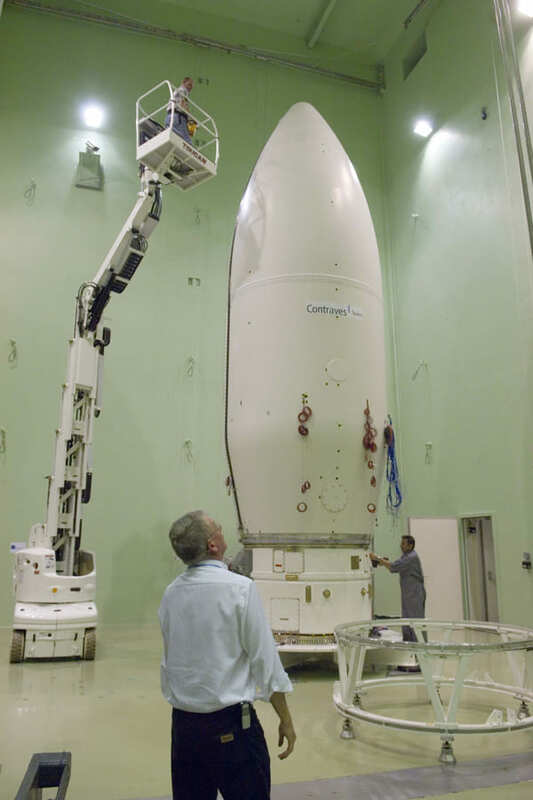 On the photo you can see a representative cargo system setup mounted on the HYDRA vibration facility. 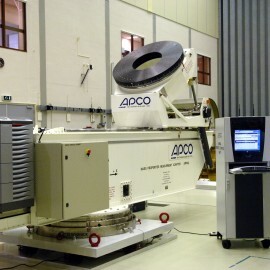 The ATV Jules Verne acoustic noise test in the Large European Acoustic Facility (LEAF) has successfully been performed. The next planned test for the ATV Jules Verne is the thermal vacuum/balance test in the LSS. On the photo you can see the ATV in the LEAF being prepared for the acoustic noise test. Today the building work of the new 640kN QUAD Multi-Shaker has started. The floor where the new shaker will be placed is being cut out this week (see photo). The new QUAD Shaker will be placed next to the existing 320kN Shaker. The QUAD Shaker will be used for vertical testing and the existing Shaker will be used for lateral testing. The QUAD shaker will be ready for customers end of 2007. The new M80 mass property facility has been installed in our environmental test centre (photo). A sophisticated canting mechanism enables mass property measurements on three axes without using the so called "L-Adapter". Planned is to take the facility in operation after some qualification tests that occur this month.